In a medium-large (4- to 6-quart) heavy pot, heat the oil over medium-high. Set a medium-mesh strainer over the top and pour in the chile mixture. Press the mixture through the strainer into the hot oil. Cooking, stirring, until the mixture is reduced to the consistency of tomato paste, about 5 minutes. Whisk the masa harina into the remaining 3 cups broth, then pour into the cooked chile mixture. Whisk until the sauce comes to a boil and thickens to the consistency of a light cream soup. Reduce the heat to medium-low. Add the chicken, green beans, chayote, or potatoes and 1 teaspoon salt. Simmer gently, stirring regularly, for about 20 minutes, until all the chicken and vegetables are tender. Add the hoja santa or cilantro, then taste and season with salt, usually between 1/2 and 1 teaspoon, depending on the saltiness of your chicken broth, and serve. Riffs on Yellow Mole: Because I have such respect for kitchen tradition (and the fact that I’ve already taken a few liberties with this revered classic here), I’m hesitant to go much further. I will say, however, that a seafood version of yellow mole is one of my favorite things in the world. When the vegetables have cooked for 10 minutes, in place of the chicken add a dozen or so mussels or clams and about ¾ pound firm-flesh fish (like halibut, bass or grouper) cut into about ¾-inch pieces. In Oaxaca, they also make a much thicker version of this sauce (they would add the equivalent of about 6 tablespoons of masa harina versus the 2 I’ve called for here) to use as a filling for what they call empanadas: They press out a corn tortilla from the prepared corn masa, lay it on a griddle to brown lightly, then flip it and top it with a spoonful of the thick sauce, a few shreds of cooked chicken and a big piece of hoja santa leaf. After folding it in half, the cook cooks the empanada on the griddle until toasty and aromatic. Where is your culinary school located at? We do not have a culinary school! But please check our youtube channel for great educational videos! I first found this recipe in your cookbook “Mexican Everyday”. This is our true comfort food. It is so easy to prepare. We live in New England so we have turned this into our hearty stew. 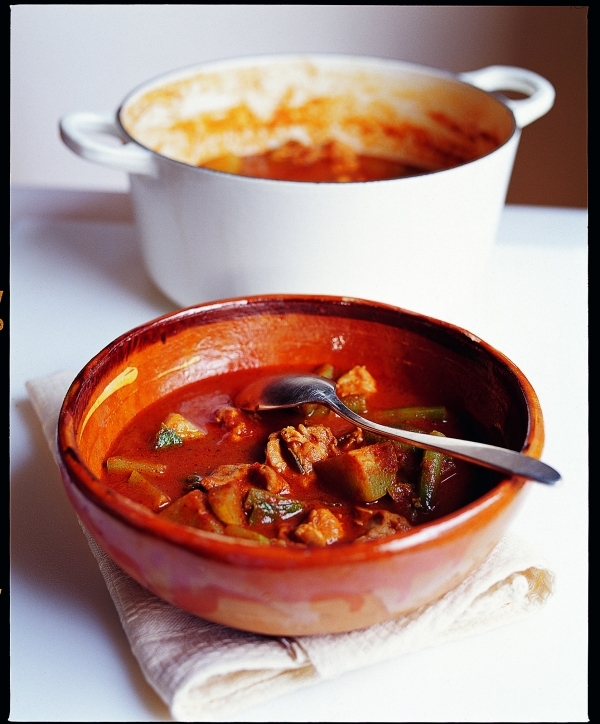 We renamed it, in our house, Mexican Stew. A couple years ago we grew Guajillo peppers and dried then just in time for the winter season to use in this delicious dish. 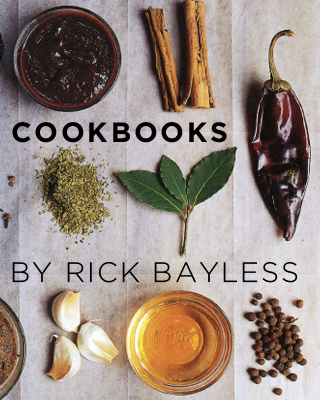 Thanks, Rick, for this and many of the foods you share with us all. Happy Holidays!! Love making your recipes. A question about this one though: In the ingredients list you call for 1 T. Masa Harina. However, in the “Riff on Yellow” section, you reference 2 T. Can you clarify whether it’s 1 or 2 tablespoons of Masa? I am a BIG fan of yours…live in ‘barrio’ in the San Fernando Valley, CA…been to Mexico with co-workers, So. of DistrictoFederal…Tepoztlan, Cuautla, Tlayacapan, etc. in Morelos…all E. of Cuernavaca…all small, colorful villages with infinite varieties of ‘street food’…a wondrous ‘las posadas’ three weeks of adventures and eye-opening experiences! Also spent many weekends in Baja back when it was not so ‘touristy’….like 40 years ago!! My son fishes there regularly in Cabo/Puerta Vallarta..he’s caught some huge tuna (350# a few times). Thanx for all your recipes…I’m totally exploring my local Vallarta market here in SoCal!! I just love the simplicity of your “translation” of the classic recipes!